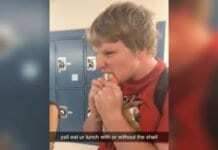 Watch This 2-Year-Old Miraculously Save His Trapped Twin Brother—Incredible! Home Family & Parenting Babies & Toddlers Watch This 2-Year-Old Miraculously Save His Trapped Twin Brother—Incredible! One parenting safety rule that many parents don’t think about or discount is the need to anchor kids’ furniture to the wall so that it won’t tip over on them. This is a situation I myself faced once, however I was in the room with my child and caught the dresser before it could hurt him. He wasn’t even climbing on it, it was a total FLUKE—and proved to me that these accidents CAN happen! 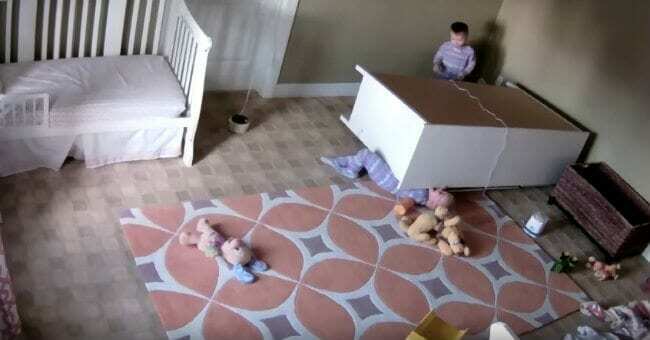 A video monitor in the bedroom of two-yer-old Utah twins Brock and Bowdy Shoff shows once again how easily disaster can strike when a child’s bedroom furniture is not securely anchored. As you can see in the video above, Brock and Bowdy were playing in their room when they tried to climb up on their dresser, which immediately fell over and pinned Brock. I have to admit, I could barely breathe during the 45 seconds or so that Bowdy walked calmly around the dresser, trying to figure out how to free his twin brother Brock. Miraculously, this tiny toddler was eventually able to push the dresser OFF of his twin and Brock wiggled free from under its weight. Honestly, I had to watch it twice to take it in!! “We know Bowdy was not alone in moving the dresser off of Brock.” You can say that again! It’s obvious God was with these sweet boys, and I pray their story will be used to encourage parents EVERYWHERE to anchor those dressers to the wall! Bowdy and Brock, I can’t wait to see what God has in store for your precious lives!